Another month, another SRC recipe. I’ve missed SRC, it was on hiatus for the Christmas season and it is finally time to post our new recipe – yeay! This month I received the fabulous blog, Shockingly Delicious, which can’t be describe with words – you just have to visit her site. She has over 25 years of food writing and recipe developing under her belt, and it comes through glaringly on her site – she has won awards for her pies, been featured in numerous newspapers for her food writing and was even featured in Saveur magazine – ya, this lady is Talented – with a capital T.
As always with a new blog to explore, I dove right in, bookmarking and pining recipes immediately. She has a young family, and so her blog features many kid friendly recipes – which adds a fun twist on a lot of the other blogs I read. I cannot wait to try a few of her pie recipes when most of the fruit comes into season (she only has 21 to choose from and you know, awards to boot). Thank you Dorothy, for a great blog and much inspiration. Now, to the recipe – umm, hello delicious. CH chose this one (it is our new “thing” with SRC – I go through the site, shortlist to maybe 10 recipes, and CH then chooses what recipe I should make). This one was a hands-down winner and one that I KNOW will be on our table again, and again. We love flavour (uh, did you know that yet?) and definitely had that. 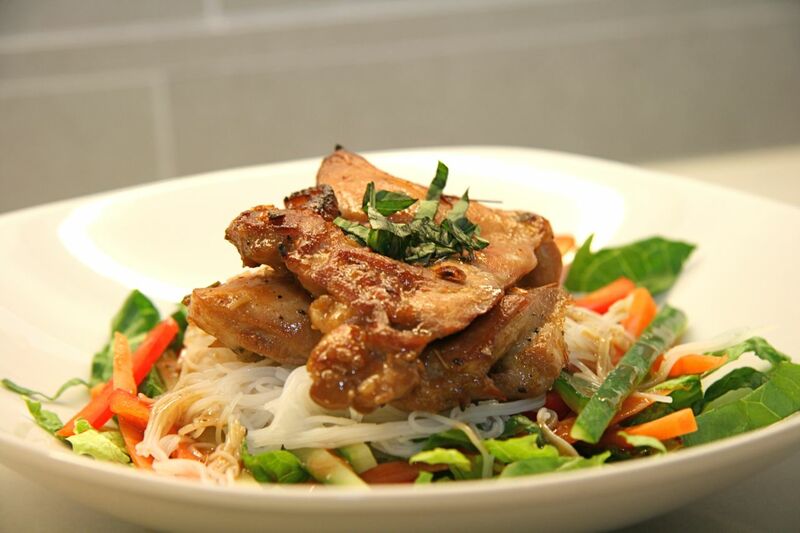 This Vietnamese-American dish was right up our alley as it featured lemongrass, ginger, fish sauce, garlic, etc., all of which blended to create an absolutely beautiful flavour profile, that left us wanting more. The only thing I changed from the original recipe was the cooking method and the length of marinading – living a) in Ontario, b) it being winter, and c) not having a patio/deck, grilling was not an option. So, I decided to bake the chicken in the marinade, broil it for a few minutes at the end (to get a crispy outside) and then I reduced the marinade to a sauce. I also opted to only marinade the chicken for 2 hours before I cooked it, and use boneless skinless thighs, and even with these changes, it was PERFECT. I am not sure if I will deviate from this method the next time I make it…we will see though. In any event, give this recipe a try. 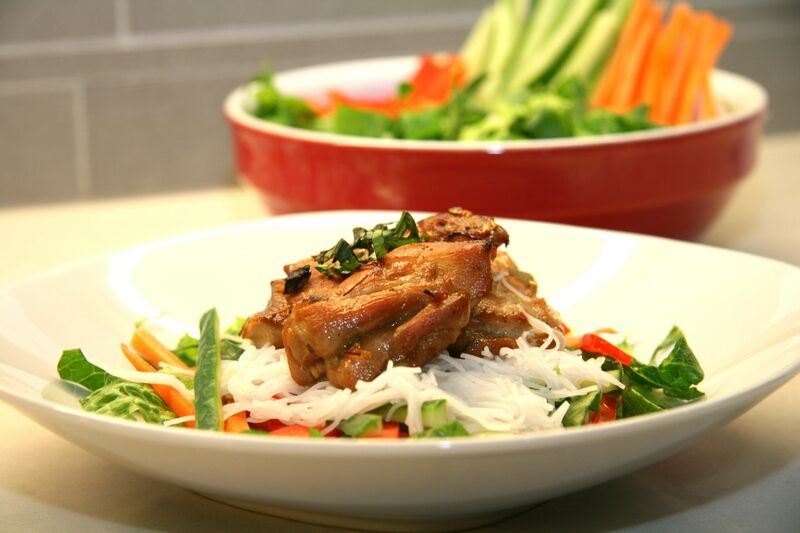 I served it over a bed of romaine lettuce, rice noodles, and julienned vegetables (red pepper, carrot, cucumber) and then sprinkled a few springs of basil on top – with the reduced sauce – it was a light, healthful dinner that was packed with flavour – just wish I had more leftovers. If you haven’t used lemongrass before – to prepare it, simply peel the outer layer of lemongras, cut off top third of stalk, then cut off root end of stalk; discard. Thinly slice the remaining lemongrass and then finely mince it. Peel and finely mince the ginger and garlic. Finely mince the jalapeno (if you like a milder flavor, begin by slicing pepper in half and removing seeds before mincing). Place the chicken thighs in large zipper-top plastic bag. Pour the marinade into the bag and massage the chicken and the marinade together with your fingers. Zip the top, squeezing air out, and marinate in refrigerator for 2 hours (original recipe says 1 hour is fine, Shockingly Delicious recommends 1-2 days). Pour the chicken and the marinade into a 9×12 baking dish. Place in oven and bake for 35 minutes, or until chicken is cooked through and no-longer pink. Turn-off the oven, and turn-on the broiler to HIGH. Broil the chicken for 2-3 minutes, or until slightly crisp and nicely brown. Using tons or a fork, remove chicken and place on plate – set aside. Place all of the leftover marinade into a small saucepan and heat over medium-high. Allow mixture to come to a boil, cook for 2-3 minutes, and then remove from heat. Strain sauce using a colander or sieve (you don’t want any random pieces of lemongrass or garlic in your dish!). Taste sauce and adjust S&P. Serve chicken with the sauce, and whatever side dish you please. 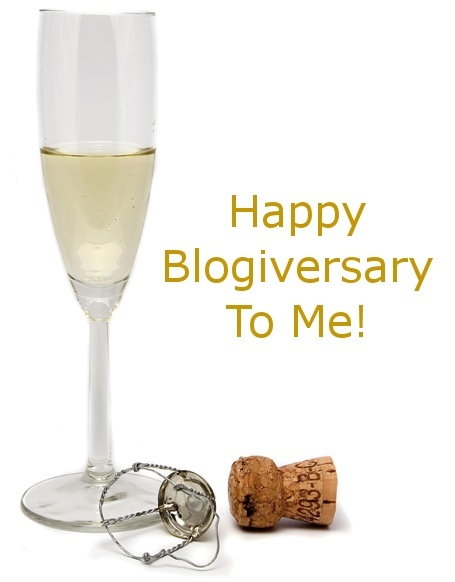 Happy Blogiversary To JBean Cuisine (& A Giveaway!)! I can’t believe it. My blog is officially 1-Year-Old!! I remember starting this blog last year – CH bought me the domain for Christmas and away I went. I remember worrying that no one would read it, that it would be boring and that I wouldn’t get the hang of it. But you know what, today as I sit here, I don’t really care about those things any more – I blog for me, I blog for you my readers and I blog because I enjoy it. I love food and trying new recipes, and that in of itself is a reason to celebrate. I have grown from a few readers (thanks CH!) to more than I can believe each day – I am truly humbled every time I look at my stats, and I thank each and every one of you for taking the time to read my little piece of the internet and my ramblings! 83 post have gone-up on this site, and probably 20x the amount of photos have been taken. I’ve blogged from London (ON! ), Paris, London (UK! ), Italy, Vancouver and now Toronto. I’ve made some great blogging friends and challenged myself in the kitchen. What an adventurous year it has been! 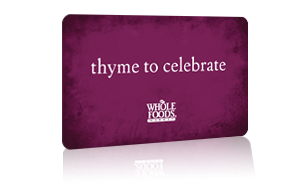 As a sign of my thanks, I am giving away a $25 gift card to WholeFoods (valid in both Canada & the US). Why this? Well, I love the store, but I also want you to go out and treat yourself to a product or ingredient that you wouldn’t always buy. Get some nice Olive Oil, or a beautiful piece of cheese and enjoy it with someone you love (or keep it all for yourself!). Basically, just have a treat on me as my way to say THANKS for being my reader. To enter, simply leave a simple note below in the comments section – either just saying “Hi”, or let me know what you’d treat yourself to at WholeFoods. 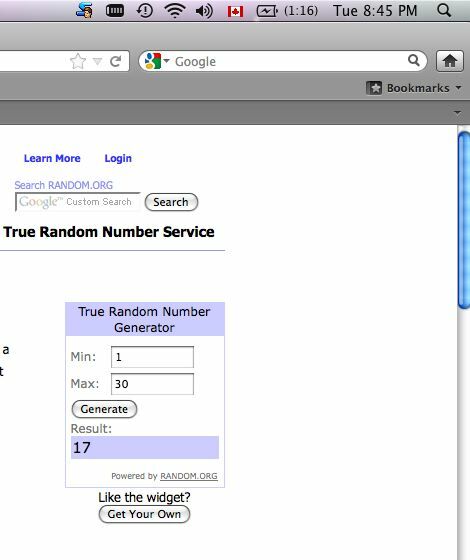 I will have CH use that software that randomly selects a winner, and I will notify you via email (so don’t forget to include it!). This giveaway is open to BOTH Canadian and US residents. A winner will be selected on Tuesday, February 28th and the gift card will be delivered electronically to your email (upon verification). I have truly enjoyed every moment of this blogging thing – even when I am cursing the light available, spilling things as a stage a photo or even forgetting to take pictures of my creations. I cannot wait to continue this journey, and I can’t wait to see what life in the kitchen brings. Thank you again, each and every one of you. Photos courtesy of WholeFoods and TheCurvyFastionista.